Berryessa Gap’s connection to the land runs deep with farming roots going back several generations. Dan Martinez, Sr., father of the owners of Berryessa Gap, was a first generation farmer of Spanish immigrants. After establishing a successful orchard business in Winters, he partnered with winemaker and wine historian Ernest Peninou in 1969 to create a grapevine rootstock nursery that would become renown in Napa and Sonoma Valley vineyards and beyond. It is from these solid roots that Berryessa Gap Winery grew. For thirty years, Martinez Orchards sold grape rootstock to vineyards in neighboring counties. Then in 2000, after purchasing the fertile Cobel Ranch land, Berryessa Gap began to grow wine grapes from its own rootstock. 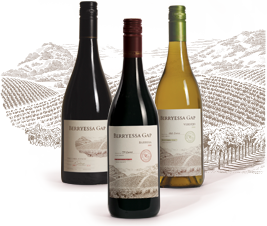 Berryessa Gap is now gaining a hard earned reputation for distinctive quality wines made from rootstock and grapes grown only by Martinez Orchards. Founded by Dan Martinez, Sr., Martinez Orchards originally was known for apricots, almonds, prunes and walnuts. Then in 1969 it began a grapevine rootstock nursery to supply nearby Napa and Sonoma wineries. While Martinez Orchard rootstock is used to make all Berryessa Gap wines, it is also grown and sold to wineries throughout California today. The University of California, Davis, celebrates the rich agricultural history of Yolo and Solano counties with its ongoing tribute to pioneer rancher, John Wolfskill. Wolfskill is known as the region’s earliest American settler having moved to the area now known as Winters in 1842. He was the first English speaking white man to discover the rich agricultural legacy of the area that lives on to this day. Wine gift items, Italian pottery and Spanish cookware can be purchased here. Rootstock also features a local art gallery and local olive and walnut oils along with gourmet cheeses and chocolates. The Rootstock gift shop is located directly across the street from our Main Street tasting room in downtown Winters. Berryessa Gap is working with other local businesses to promote the charm and character of Historic Downtown Winters. Berryessa Gap was one of the first establishments to open in downtown Winters as part of a plan to revitalize downtown making it an attractive and desirable destination for locals and visitors alike.